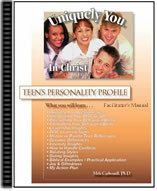 This facilitator's manual is to be used with the Teens Personality Profile. Great for Teens, Youth, Parents and Teachers! Find out how exciting and enlightening discovering your natural giftedness can be!